Andrew Murawa is the RTC correspondent for the Mountain West Conference. As we look forward to the Mountain West Tournament in Las Vegas in just three weeks from now, we can also begin to look forward to future MW tourneys there, as this past week the conference announced that it approved a deal to keep the conference tourney in the Thomas & Mack Center for at least three more years after this March. And while the conference, fans, and media are all pleased, there are plenty of Mountain West coaches who, though unsurprised, are not happy with this arrangement. Steve Alford and Larry Shyatt are just two of the coaches who have gone on record opposing having to play for the league’s automatic bid on the home court of league rival UNLV, but with the MW Tourney having previously flopped in Denver and now an unmitigated success in Las Vegas (for example, this year the conference reports record ticket sales), odds are strong that the tournament location won’t be changing anytime soon. As for this year’s tourney, now that we finally have some separation at the top of the conference, it looks like a two team race for the #1 seed in Vegas come March. With San Diego State dropping a pair of games and UNLV getting bitten by Air Force on the road, New Mexico and Colorado State now sit atop the conference standings, three games in the loss column ahead of UNLV, SDSU and Air Force. While this weekend’s game between those two at Fort Collins will go a long way towards determining that winner, we’ve still got a lot of basketball to play. 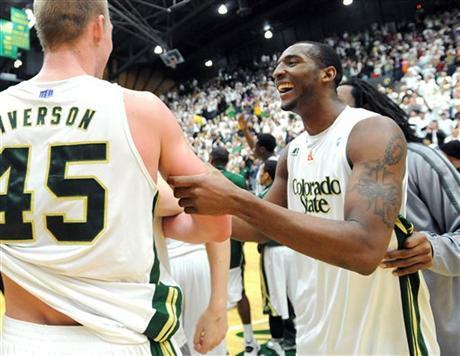 Colorado State – The Rams got a big final minute from Dorian Green on Wednesday night to knock off San Diego State in Fort Collins, then went on the road Saturday and held on for a rare road win over Air Force. Larry Eustachy’s bunch is still making its hay by dominating teams on the glass; they haven’t had an offensive rebound percentage lower than 35% since January 2, and they’re regularly turning those second chance opportunities into points, putting the Rams in the top 10 nationally in offensive efficiency. And yet, despite perhaps the best rebounding team in memory, a rotation loaded with experienced seniors, and a six-game winning streak (as well as 27 home wins in a row), for some reason people are still a little leery about this team. Nevertheless, if they can extend that home winning streak to 28 on Saturday night against New Mexico, regardless of what happens tomorrow night at UNLV, the Rams should be the conference favorite. Another week down the drain and we’re now officially four weeks away from the start of the Mountain West Tournament (well, three weeks and six days by the time this gets published). And, as time passes, some things are becoming more clear and some things are just as confusing as they were weeks ago. For instance: quick, who’s the best team in the conference? New Mexico’s got a claim on first place as of now, but they’re coming off a season-series-evening loss to UNLV and they’ve already put up a horrendous 34-point offensive (in more than one way) output against San Diego State. The Rebels, for their part, have looked really good in their home win against New Mexico and their road win at San Diego State, but this is a team that just this week lost at Fresno State, the worst team in the conference. The Aztecs? Their backcourt is beat up and their still facing road trips to Colorado State, UNLV, New Mexico and Boise State. Oh, and they’re entering that stretch already a game back of the Lobos and a half-game behind Colorado State. And as for the Rams, despite the fact that they made the AP Top 25 for the first time in just under 60 years, they’ve still got plenty to prove themselves, with a history of struggling away from home, especially against quality opponents. But, for now, I’m going to go out on a limb and put CSU at the top of the pack, based on a whim. But hey, give me credit at least for not taking the easy way out and declaring this a four-way tie for first atop my power rankings. So, that’s the clear as mud part. What parts of this conference are starting to round into understandable shape? Well, that pipe dream back a few weeks ago about six teams making the NCAA Tournament? Yeah, well, that’s not gonna happen. Wyoming and head coach Larry Shyatt have done great things over the past two seasons in Laramie, but they’re getting eaten alive in conference play (2-7 so far) and it would take a complete 180 for them to have a prayer of NCAA consideration come March. Meanwhile, Air Force, which had been so hot the last time we talked, just got done dropping a couple of road games, most damningly to Nevada on Saturday. They needed a lot of stuff to break their way, and while they’re certainly not completely dead yet, I’ve got to see them make some serious noise, especially on the road, in order to think they belong even on the periphery of the conversation. And that leaves Boise State as the potential fifth Mountain West team. There isn’t a lot of room for error for the Broncos, but I, for one, have a hard time believing they won’t be among the field of 68 when the brackets get announced. Elsewhere, you can start engraving Anthony Bennett’s name on the Freshman of the Year trophy, if you want to get a head start. And the list of serious Player of the Year candidates are limited as well; right now Jamaal Franklin has to be the odds on favorite to defend his title, with Bennett maybe his strongest competitor. As for Coach of the Year, that one is still wide open and will likely be determined in part by how the race at the top of the conference shakes out. San Diego State – The Aztecs didn’t leave Viejas Arena this week, but they also didn’t lose, something that only one other Mountain West team (Colorado State, who played just one game) can say. The Aztecs dodged a bullet against Boise State, but then came out and put away Fresno State with a dominating second-half performance. 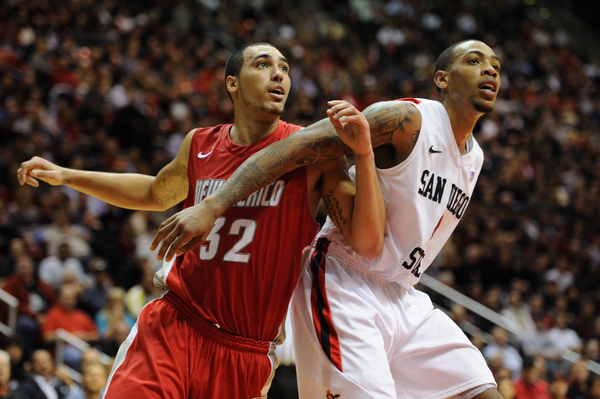 While still not back to full-strength (Xavier Thames, for one, remains limited, although Chase Tapley nears 100%), the Aztecs find themselves just a game back of first place with a chance this week to take a couple huge steps towards a conference title. Of course, those huge steps include going on the road to Colorado State and UNLV, but let’s put it this way: if SDSU wins these games, they’re in very good shape. The dream around the Mountain West is six conference teams making the NCAA Tournament. But, in order for that to realistically happen, the top six teams here need to separate from the bottom three, with the teams at the back end of that first six earning at least a win or two over the upper-echelon teams. This week, that plan did not come to fruition. Boise State took care of Fresno State at home (good!) but then lost to Nevada on the road (bad). 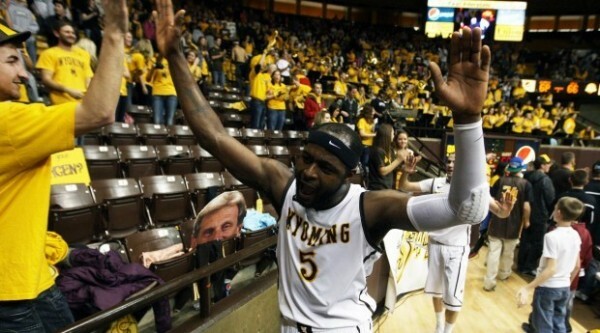 Wyoming lost on the road to UNLV (not good, but not unexpected), but then went back home and lost to Air Force (bad). In fact, Air Force has now knocked off a pair of MW teams dreaming of sneaking through that NCAA bubble (they knocked off Boise State the previous week) and, crazy as it may seem, they have their own devious designs on sneaking into the bracket come Selection Sunday. We’re now exactly one-third of the way through the conference schedule and one game in the standings is the difference between first and fifth place. Just two games separate first and seventh. And that team that started 13-0 and was among the last undefeated teams in the nation? Yeah, um, Wyoming is in eighth place and in need of 50 cc’s of an offensive injection, stat! San Diego State – Two weeks ago, the Aztecs lost on their home court in convincing fashion to their biggest rival in the league, UNLV, then followed that up with a lackluster performance in a loss at Wyoming, sinking them back to .500 in the conference and causing some to reevaluate just how strong this team was. Well, Steve Fisher and company had an answer for those questions this week, first tearing through Nevada in Reno on Wednesday night, then coming home and absolutely locking up New Mexico in front of The Show. Their smothering defense held the previously unbeaten Lobos to a field goal percentage in the 20s and just 34 total points (UNM’s lowest total of the year), helping them to overcome their own relatively unimpressive offensive performance. With point guard Xavier Thames just starting to work his way back into playing shape after a back injury, and with freshman Skylar Spencer seemingly improving by the game, the Aztecs seem to be a team that has hit their nadir and is on its way to bouncing back up. Allen Huddleston, Junior, Fresno State – Handing out the POTW honors to a guy whose team just went 0-2 for the week is not a precedent I’m thrilled to set, but in a week without a bunch of great options, rewarding a guy for keeping a positive attitude and finding a way to help his team out seems like as good a way as any to go. You see, after transferring in from Pacific and starting the first 11 games of the season (while averaging a hair under 30 minutes a game), Huddleston lost his starting spot to freshman Aaron Anderson and saw his minutes slashed (down to about 12 minutes a game over the next six games). When he did get into the game, he seemed to force the action in an effort to regain his coaches’ trust, but the low point came in a couple of oh-fer performances in extremely limited minutes against Sonoma State and Nevada. But rather than pout or quit on his team or transfer again (although, certainly, he did have some low moments in the interim), Huddleston kept working and was rewarded by head coach Rodney Terry with 55 total minutes of run this week. And he responded with his best two back-to-back performances of the year, averaging 17.5 points, three assists and two steals while knocking down seven three-pointers over the course of the week (and shooting a 64.6% eFG). While his play didn’t wind up earning his team a win, you can be sure he did his best to give his team chances to win those two games. Skylar Spencer, Freshman, San Diego State – Yeah, Huddleston is a newcomer, so he could just as easily be here too, but Spencer deserves some pub too. You see, the freshman big man hasn’t missed a shot from the field since January 12 — four games ago. For the year he’s made better than 76% of his shots. As you might expect, Spencer’s range is basically a dunk (or closer), but give credit to the guy for knowing his strengths, accepting his limits and doing the things his coaching staff wants him to do. Yeah, that basically comes down to stuffing home point-blank opportunities, grabbing rebounds and playing defense, but he’s done all of that well. He blocks nearly 10 percent of his opponents’ two-point field goal attempts, has quick enough hands to dislodge a ball on the floor and is a beast on the offensive glass. While the SDSU rotation is crowded, Spencer has carved out a nice 20-minute-per-game spot for himself. Oh yeah, and the “of-the-week” part of this: try on 5-of-5 from the field, 10 points, five boards, three blocks and four steals. It’s been two weeks since we last caught up with the teams of the Mountain West, so we’ve got a lot to catch up on. All three of our favorites in the conference (San Diego State, UNLV and New Mexico) have taken losses since we last did this, but at the same time, each of them has a quality win mixed in there as well. Meanwhile, the next tier of teams – Colorado State, Wyoming and Boise State – have all been blemish-free over the past two weeks. It still appears there is a drop-off between the top three and the next three, but it remains to be seen just how far that drop is. We’ve got one more week of some pretty uninspiring non-conference games before conference play tips off and we start to get some answers to our outstanding questions. We’ve also been keeping our eye on a situation off the court, as the conference realignment shuffle continues. On New Year’s Eve, it was reported that Boise State would wisely back out of its agreement to join the rapidly dwindling football Big East and remain in the Mountain West. With Boise sticking around, suddenly San Diego State, which had been steadfast in its intentions to stick with the move to the Big East, decided it too wanted to stick around, but the Mountain West, apparently fed up with SDSU’s foot-dragging prior to that, isn’t exactly jumping back into the relationship. ESPN’s Brett McMurphy reports that the MW is poking around to see if there are other schools who would be a better fit with the conference. In the end, perhaps the only thing that would keep SDSU out of the conference would be if the MW is able to persuade BYU to rejoin. In an ideal world from a basketball perspective, both of those schools would rejoin, which would bring the conference up to 12 basketball teams next year, but that would also bring the football total to 13, probably one too many. If it is a choice between BYU and SDSU, though, the Cougars are the slam dunk choice. All of this was made possible when CBS allowed the conference to restructure its television agreement, allowing the conference to sell games to other national networks. It should be noted that the MW did have to cave to a pretty significant request wherein Boise State’s home football games will not be a part of the conference’s television rights contracts, allowing the school to sell those games themselves. Further, Boise will still owe some sort of buyout to the Big East for their change of heart (provided such an entity still exists to pay that buyout) and the Mountain West has agreed to chip in some amount to help Boise make that payment (rest assured that such an arrangement will not be made with SDSU). While this works out for the time being in keeping the conference together and perhaps even persuading BYU to rejoin, this sort of concession to one school at the exclusion of others is the exact type of thing that drove Nebraska and Texas A&M out of the Big 12. It remains to be seen if this type of move is sustainable, but, if everything works out for the best, we could be heading back to a MW basketball slate that still features SDSU, UNLV, BYU and New Mexico as its flagship programs. It the realm of unintended consequences, is quite possible that the Big East’s Catholic Seven defection could go a long ways towards rescuing another great basketball conference. Colorado State – The Rams swept to an impressive win in the Las Vegas Classic tournament just in advance of Christmas, winning four games in a week and capping that run off with a 36-point blowout of Virginia Tech in the championship game. They backed that up with a workmanlike 25-point win against Adams State this past weekend. We still don’t know just how good this team is after they’ve been completely remade from a guard-dominated team to one that relies on crashing the boards, and they still haven’t been tested much, but CSU fans have good reason to suspect that this iteration of the Rams is even better than last year’s tournament team. On Monday, San Diego State’s Jamaal Franklin was named the Mountain West Player of the Year (nevermind the fact that we at RTC gave Drew Gordon the nod) after a blazing conclusion to the regular season. On the first day of postseason play in the conference, Franklin reminded everybody just how good he can be. With the shot clock turned off and Boise State having run back to tie their quarterfinal game with the Mountain West regular season champion, the Aztecs called a timeout and set up a play that everybody in the Thomas & Mack Center knew was headed Franklin’s way. The Broncos tried to deny him the ball, but San Diego State point guard Xavier Thames got him the ball, and then, as Franklin is known to do repeatedly in practices, he counted down the final seconds on the clock and threw up a prayer at the buzzer, this time over the hands of two Boise State defenders. And the prayer was answered, as the ball settled softly into the net, advancing the Aztecs to Friday night’s semifinal. San Diego State was in that dogfight down the stretch in part because they helped a game Boise State get back in the game. The Aztecs were up 11 with under six minutes left, but down the stretch they missed layups, missed free throws and turned the ball over three times, the most memorable one coming when Chase Tapley turned it over in the backcourt, leading directly to the game-tying layup for the Broncos on a nice dish from freshman Anthony Drmic to sophomore Thomas Bropleh. Tapley was, however, a hero most of the day for the Lobos, at one point scoring 10 out of 12 San Diego State points and contributing 20 points (including four threes) and numerous under-the-radar plays. Andrew Murawa is the RTC correspondent for the Mountain West and Pac-12 conferences. We have suspected since late November or so that the bottom half of this conference was pretty darn good, but we still figured that when push came to shove it would be UNLV, San Diego State, and New Mexico mostly dominating the other five teams in the league. And yet, last Saturday we saw the Aztecs fall to an undersized Colorado State club, while this week it was UNLV’s turn, as they lost a tough roadie at Wyoming on Saturday night. Along the way, both SDSU and UNLV have had other struggles with Air Force and Boise State, two teams who are a combined 1-13 in the Mountain West. The lone team in the conference that has been taking care of business on a regular basis lately has been New Mexico, winning its last four games by an average of more than 26 points. The only problem there, however, is the Lobos were uncompetitive at UNLV and folded in the second half of a home game with SDSU. So, for now, it appears that New Mexico is playing the best ball in the conference, but they will need to prove themselves against the Aztecs and the Rebels next week before we can really take them seriously. 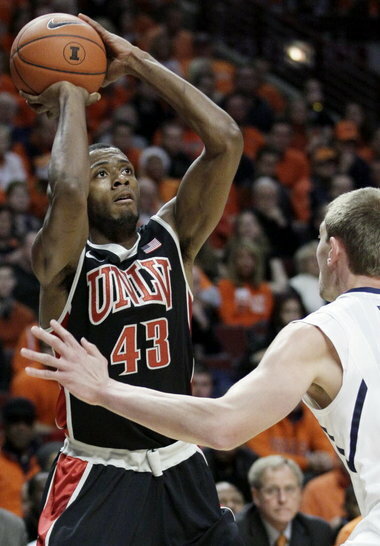 Saturday’s slate in the Mountain West represented the halfway mark in the conference season. San Diego State sits atop the conference with a 6-1 record, with New Mexico and UNLV a game back and Wyoming and Colorado State, two teams who are at least in the NCAA at-large discussion, a game back from there. Looking forward to some of the postseason awards, it looks like UNLV’s Mike Moser (14.5 PPG/11.5 RPG), who leads the conference in rebounding and is fourth in scoring, is the favorite for the Mountain West’s Player of the Year honor, with San Diego State’s Jamaal Franklin (16.0 PPG/7.2 RPG) and Chase Tapley (15.9 PPG/4.2 RPG/2.1 SPG) perhaps the only other names in the mix right now. For Coach of the Year, there are several names that deserve to be considered. 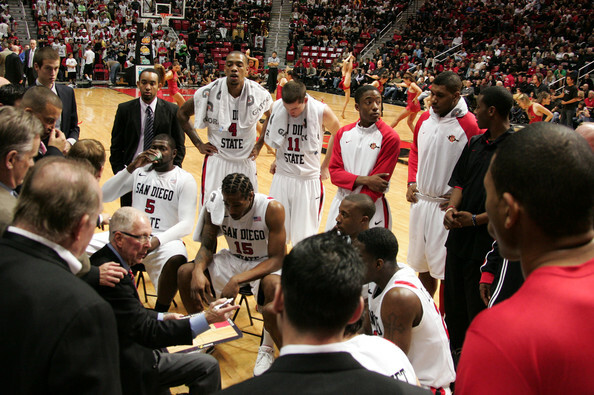 SDSU’s Steve Fisher may be the favorite at this point, rebuilding a team on the fly after losing four of five starters from last year’s Sweet 16 team, but he’s just one of many MW coaches who are excelling this year. UNLV’s Dave Rice took over in Vegas when Lon Kruger left for Oklahoma, and he not only didn’t skip a beat, he seems to be on the verge of turning the Rebels back into a consistent national power again. At Wyoming, new head coach Larry Shyatt has completely turned around the culture in Laramie, taking a team that was a 10-21 disaster last year and building a hard-nosed consistent bunch out of largely the same cast of characters. Meanwhile, Tim Miles has taken a completely undermanned Ram team with no player over 6’6” earning significant playing time and put them in good position to possible earn an NCAA Tournament bid. Heck, even Jim Christian at TCU is working wonders. Last year the Horned Frogs lost 14 of their last 15 games; this year they’ve got pretty much the same crew and they’re now 13-9 with a chance of a better than .500 record (although their remaining schedule is brutal). While Fisher is the odds-on favorite to take down the honor, all of those coaches are doing great jobs. The Freshman of the Year award is a bit more muddled. Early on, it looked like Boise State’s Anthony Drmic would run away with it, but he hit a wall midseason and has struggled lately; he shot a 57.7 eFG% in the non-conference slate, but is now hitting just 36.5% in conference play. New Mexico’s Hugh Greenwood has made a big splash in Albuquerque after taking over the point guard duties early in the season, but his effectiveness has taken a hit since an ankle injury in early January, and he’s not yet back to the same player. Boise’s Derrick Marks is averaging 9.0 points per game and has come on strong of late, but he is still a fairly up-and-down player. Then there’s TCU’s Kyan Anderson, who went for 22 points against SDSU this weekend and who figures to be an impact player for the Frogs in the future, but whose overall numbers this season don’t really merit FOTY consideration. If you expand the definition out to Newcomer of the Year, there are all sorts of good options (Leonard Washington at Wyoming, Xavier Thames at San Diego State, and, the clear cut winner, Moser), but halfway through conference play, the FOTY award is still very much up for grabs. New Mexico – For the second consecutive week, the Lobos take home the honors here on the strength of a 2-0 record over lesser Mountain West teams; the twist this week was that they scored both of those wins on the road. UNM started the week by scoring a 39-point win at Air Force in which they dominated almost every aspect of the game, then they wrapped it up with a 16-point win at Boise State. The theme for the week was balance, with six different players scoring in double figures this week, but particular highlights included Hugh Greenwood’s 10-point, 10-rebound double-double against Boise State and Demetrius Walker’s 11-point, eight-rebound outing against Air Force. Leonard Washington, Jr, Wyoming – For the second time in three weeks, Washington earns our POTW. His best game of the week came in a disappointing loss at TCU, but Washington was excellent there, hitting 8-10 field goal attempts, including a three-pointer, for a 21-point, six rebound outing. He backed that up by fighting Mike Moser to a draw in the Cowboys’ Saturday-night upset of UNLV, scoring 16 points and grabbing seven boards while setting a general tone of confidence throughout the game. Andrew Murawa is the RTC correspondent for the Mountain West and Pac-12 conferences and a microsite staffer for the Pac-12. 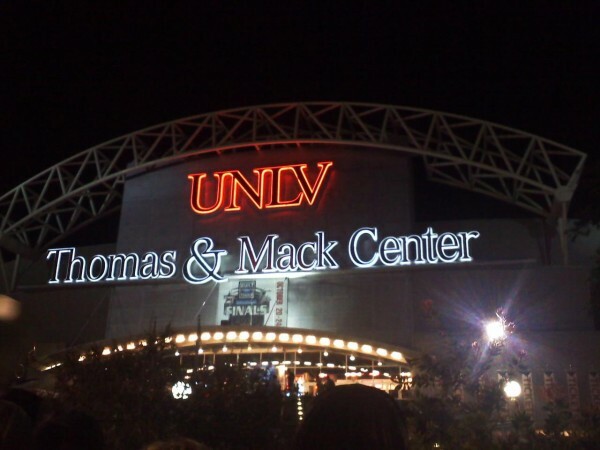 While a couple Mountain West teams took their lumps early in the week, the weekend was an unabashed success for the teams at the top of the conference, clearly highlighted by UNLV knocking off the nation’s #1 team, North Carolina, at the Las Vegas Invitational Saturday night. In the process, and with preseason co-favorite New Mexico struggling to find its stride early, the Runnin’ Rebels have grasped the mantle of sole favorite in the conference. The Lobos lost their second game of the season on Thanksgiving night, dropping an overtime game to Santa Clara at the 76 Classic, but they rebounded to sweep through an unimpressive consolation bracket in that tournament. And San Diego State confirmed the fact that they are, in fact, a contender not only for an NCAA Tournament bid, but a league title, despite losing the bulk of last year’s Sweet Sixteen team. While there are some other solid teams among the rest of the conference, these three have risen to the top as the cream of the conference, but the strength and depth of the conference can be seen in the MW’s collective 39-10 record (second in the nation behind only the Big Ten’s 63-10 record) including a 3-0 record against the ACC and a 6-2 record against the Pac-12. UNLV – Last week the Rebels probably should have been the pick here, but in the interest of mixing things up, I went with Boise State. This week Dave Rice’s team leaves no other option. Not only did the Rebels beat the #1 team in the country, they handled them pretty well, winning 90-80, outrebounding the vaunted Tar Heel front line (31.7 OR%, 78.6 DR%) and knocking down 13 threes (spread out over five players) to seal the deal. Last year at this time, the Rebels were coming off of an impressive championship performance at the 76 Classic, but were never really able to capture the energy they showed that weekend the rest of the season. It remains to be seen if this vintage of the Rebels has a staying power that last year’s team did not. Mike Moser, Sophomore, UNLV – Much like the TOTW award, Moser could have and probably should have taken down this award last week. This week, no such slight as he averaged 13.3 points and 13 rebounds per game, and stepped up his game even another notch in the UNC upset when he had 16 points, 18 boards, added six assists and even dropped in his first two three-pointers of the season (although, his shot selection may be one area he could still stand to work on). With his long arms, freaky athletic ability and feel for the game, you can expect to see his name here again this year. San Diego State 76 UC Santa Barbara 75 (OT) – The Aztecs traveled north to Santa Barbara to face a formidable foe Saturday night and needed a late 11-0 run in regulation to eventually force overtime, then an improbable ending to seal the victory in overtime. SDSU head coach Steve Fisher was the Michigan coach when Chris Webber infamously called a timeout that his team didn’t have in the waning moments of a national championship game. On Saturday night, Fisher’s Aztecs were on the receiving end of a similar play. With SDSU up three and the clock under ten seconds, UCSB’s Orlando Johnson lost control of the ball near midcourt. After Johnson recovered the ball in a scramble, an unidentified Gaucho called for timeout; unfortunately for them, they had just used their final timeout minutes before. Jamaal Franklin sank one of two technical free throws, effectively sealing what had been a great back and forth game. Point guard Xavier Thames had his best game as an Aztec, going for 20 points, ten rebounds and six assuists, while UCSB’s Johnson had 26 points, seven rebounds and four assists. Creighton @ San Diego State, 11/30, California @ San Diego State, 12/4 – The Aztecs stretch of incredibly tough non-conference opponents wraps up this week with visits from the favorites of the Missouri Valley and the Pac-12 conferences. By the end of the week, SDSU will have played six top-75 teams (according to Ken Pomeroy’s ratings), and if they can continue the success they’ve had in the opening weeks of the season, they could earn serious consideration for a national ranking. Creighton’s sophomore wing Doug McDermott leads a Blue Jay team that is #1 in the country in effective field goal percentage, and the Aztecs defense will have to take a big step forward to slow down that offensive attack on Wednesday. Then on Saturday, the Golden Bears backcourt duo of Allen Crabbe and Jorge Gutierrez will be pitted against SDSU’s backcourt in a battle of the two team’s strengths. In honor not only of UNLV’s 13 three-pointers in their win over UNC on Saturday, but also of the 25th anniversary of the introduction of the three-point shot to the college game, it is worth noting that the Rebels hold the NCAA record for consecutive games with at least one made three-pointer, with 812 games. The Rebels are joined by Vanderbilt and Princeton as the only three teams in the country who have made at least one three-point field goal in every game since the rule was implemented, but since the Rebels have played more games than the other two schools, they currently hold the record. 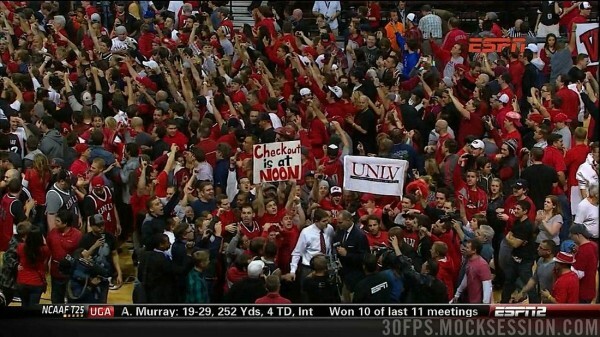 Runnin' Rebels Fans Participated In An RTC-Approved Court Storm Saturday Night After UNLV Toppled #1 North Carolina. A Look Ahead: Tough week for the Rebels, especially in the penumbra of the North Carolina victory; the team travels to UC Santa Barbara on Wednesday night (and RTC Live will be courtside there) and heads to Wichita State on Sunday. 2. San Diego State (7-1): It’s important to remember what the Aztecs are missing from last year’s Sweet 16 team. First, NBA lottery pick and freak-of-nature Kawhi Leonard’s double-double and lock down defense are gone. Senior forwards Billy White and Malcolm Thomas (21.7 highly efficient points and 12.5 rebounds between them) are also gone. And floor general-supreme and master of the clutch hoop, D.J. Gay, also gone. The only two returnees who played significant roles for last year’s club – Chase Tapley and James Rahon – were merely low-usage role players. This year, however, Tapley has stepped up and taken over not only a leadership position on this team, but also the role as go-to scorer. He has attempted double-digit field goals in six of the Aztecs first eight games, scored in double figures in the same number of games and done so while knocking down exactly half of his 46 three-point attempts to this point. Rahon hasn’t been quite so lucky yet, as an ankle injury kept him out of SDSU’s first three games and he has yet to really hit his stride yet. The three-point specialist did post a career-high 20 in the win over Long Beach State, but he’s struggled with his stroke from deep, hitting just three of his 20 attempts thus far. A look ahead: We detailed the Aztecs’ tough stretch at home above in our Game of the Week section, but after this week, SDSU takes a significant step down in the remainder of its non-conference schedule, with games against Division III and NAIA teams mixed in with ho-hummers against Big West and WCC also-rans. 3. New Mexico (4-2): It hasn’t really been the start that New Mexico fans expected. The loss to in-state rival New Mexico State? Okay, it’s a hard-fought rivalry game; anything can happen. You can write off a loss there with any number of excuses or explanations. But the 76 Classic opening round loss to Santa Clara? That one was inexcusable. Defensive problems were exposed in that game (notably the fact that as athletic as Kendall Williams is, he had no chance chasing SCU’s Kevin Foster off multiple screens every possession), but give the Lobos credit – their defense looked better in the final two games of that competition, albeit against lesser competition. Further, the New Mexico offense showed signs of coming into its own, with freshman Hugh Greenwood clamping down the point guard position that he’ll likely hold for the next four years with a three-game, zero-turnover performance over the weekend. Moreover sophomore wing Tony Snell continued his vastly improved play, hitting 18 of 32 field goals (and 12/24 threes) on his way to a stellar weekend. Williams and Drew Gordon, the established stars on this club, still have yet to really get comfortable out there, but with Greenwood running the offense smoothly and Snell giving opposing defenses a third scoring option to worry about, expect the Lobo big guns to have a bit more room to operate. A look ahead: A visit from Idaho State on Wednesday precedes a tough matchup in the MW/MVC challenge on Saturday when Missouri State visits Albuquerque. 4. Boise State (4-1): The Broncos got brought back down to earth a bit on Tuesday with a ten-point road loss at Long Beach State, but given that the 49ers are a high-caliber opponent, there is no shame in that loss for BSU. The Broncos bounced back Saturday with a 14-point win over Northern Illinois, and the trend of new players stepping up every night for head coach Leon Rice continued as sophomore guard Jeff Elorriaga went for 14 points on the night. Offensively, Elorriaga is nothing but a bomber. On the year he has attempted 20 field goals; 18 of those (and all six of his makes on the year) were from behind the arc. Kenny Buckner, a bruising jucotransfer, also picked things up this week, posting a season-high 14 points in the loss to LBSU. Buckner provides a good presence in the middle for the perimeter-oriented Broncos, averaging 5.4 rebounds in 18.8 minutes on the season. A look ahead: The Broncos host a couple of MVC opponents this week, with Drake coming in on Wednesday night before Indiana State visits on Saturday. The latter game is the only official part of the MW/MVC Challenge. 5. Air Force (3-1): The Falcons only played one game this past week – a 76-73 overtime loss to Colorado – but they’ll hold on to the #5 spot this week, if only because, you know the Pac-12 is so strong that a loss to one of its member institutions is no big deal, right? Anyway, Michael Lyons continued his sparkling start to the season by going for 31 points, seven rebounds and three steals in the losing effort. Junior Todd Fletcher continued his solid play at the point by handing out six assists in the game; he’s had at least six assists in every game this season against Division I competition. And junior center Taylor Broekhuis has shown that as long as he can stay out of foul trouble (which he did not do in the Falcons’ season opener against Army) he can provide a strong interior presence for the Academy. A look ahead: It’s another slow week for the Falcons, with only a trip to Des Moines on Saturday for a matchup with Drake ahead. 6. Wyoming (6-1): The Cowboys have lost the toughest game they’ve played this year – a road trip to face Green Bay, a team that is just 2-4 on the year – and have beaten no one of consequence (they’re best win is over Northern Colorado, another 2-4 team). But the mere fact that the Cowboys are beating these teams is an accomplishment. Last year, Wyoming lost to Northern Colorado by 14, to North Florida by 16 and to South Dakota by ten. While this team may not have the talent to measure up with the big boys at the top of the league, at the very least they are competing under new head coach Larry Shyatt. This week it was redshirt junior guard Luke Martinez, who misses all of last season with a broken elbow, who led the way, averaging 17 points per night and knocking down 16 out of 26 three-pointers in the Jim Thorpe Classic round-robin tournament in Laramie. Fellow guard Francisco Cruz pitched in with three consecutive double-figure games, while freshman forward Larry Nance, Jr. (does that name ring a bell?) had his best game of his young career on Saturday with nine rebounds and four steals, although his offensive game is still not quite ready for primetime. Also worth noting is that JayDee Luster, who struggled to take care of the ball under previous head coach Heath Schroyer, has handed out 26 assists this season while only turning it over three times. A look ahead: Utah Valley on Wednesday won’t raise the bar much, and a visit from a poor Bradley team in the MW/MVC Challenge on Saturday means the Cowboys have a good chance to get to 8-1 before they face Colorado on 12/9. 7. Colorado State (4-2): The Rams won both of their games this week, but the fact remains that the team’s best win was in the opener over an average Montana team. With no real producers on this team over 6’6”, this team is going to go as far as its backcourt triumvirate of Wes Eikmeier, Jesse Carr and Dorian Green will take it. This week, in close wins over Texas-San Antonio and Manhattan in the NIT Season Tip-Off consolation bracket, Eikmeier and Green were strong, each scoring in double figures in both games (Eikmeier 20.5 PPG this week, Green 16 PPG). None of the three guards are true lead guards, but all share the duties at point; the problem is that none of the three are great at creating opportunities for teammates. Up front, Greg Smith and Will Bell are hard workers (the two combined to average 18.8 PPG and 10.5 RPG), but they could get overpowered even by a relatively small frontcourt like SDSU’s. A look ahead: The Rams will get a couple of good tests this week, with Colorado visiting on Wednesday, followed by a trip to Northern Iowa on Saturday. 8. TCU (4-2): After a strong opening win in the Paradise Jam, the Horned Frogs dropped their final two games, with Ole Miss sending the team back home with an 11-point loss. But they bounced back on Saturday with an exciting one-point win at Houston. After Houston took a one-point lead with six seconds left, senior wing J.R. Cadot rebounded his own miss and scored with under a second left to give TCU their fourth win on the year. The 6’5” Cadot has taken it upon himself to hit the glass with abandon this season, leading the team in rebounds and generating offense for an team without a lot of offensive options by crashing the offensive boards. Juco transfer Adrick McKinney has also been helping out on the glass and while this is still a relatively undertalented team, head coach Jim Christian is getting the most out of the players he does have. A look ahead: Lamar visits Fort Worth on Wednesday, with a trip to Evansville lined up on Saturday. Andrew Murawa is the RTC correspondent for the Mountain West and Pac-12 conferences and a Pac-12 microsite writer. Coming into the season, New Mexico and UNLV were the clear favorites to be the class of the conference this season, with the other six teams in the conference were littered with question marks. After a little more than a week of the regular season, UNLV has more than lived up to expectations while New Mexico has already stumbled once (to in-state rival New Mexico State) and has generally looked shaky at best. Around the rest of the conference, San Diego State has been the most active, already completing six games and losing only a road game to Baylor, RTC’s #11 team in the country. TCU pulled off a big surprise with a win over Virginia in the Paradise Jam (nevermind the fact that it backed up that breakthrough with a loss to Norfolk State). Air Force is undefeated through three games, sweeping the All-Military Classic with wins over Army and Virginia Military. And then, there’s our team of the week, below. Boise State – All apologies to UNLV, who has looked excellent in its four games so far, but the nod here goes to the Broncos, who have impressed in their first three games as members of the Mountain West. They’ve played nobody of note, but at least they’ve handled those three teams (Colorado Christian, Utah and Cal State Northridge) with ease, winning the three games by an average of 38 points per outing. Despite replacing three starters with a roster chock-full of newcomers, BSU has had three different players lead the team in scoring in its three games, and it has had seven different players score in double figures at least once. They’ve got bigger tests ahead (starting tonight with a trip to Long Beach State), but they have sure started well. Chase Tapley, Junior, San Diego State – There are a lot of possibilities here, including Tapley’s sophomore teammate Jamaal Franklin who has been outstanding, but we will go with Tapley for his across-the-board production and efficiency. In six games, Tapley has averaged 16.5 points per game, while contributing nearly five rebounds a night, 2.5 assists per outing and more than three steals a night, all while shooting 47.8% from the field and 53.1% from three-point range. In the Aztecs lone loss, it was Tapley who kept them in shouting distance, posting a career-high 28 points while hitting eight of his ten three-point attempts in their loss to Baylor. Andrew Murawa is the RTC correspondent for the Mountain West and Pac-12 conferences; he is also a staffer on the Pac-12 microsite. You can find him on Twitter @AMurawa. Tectonic Shifts in the MW: As the landscape of college sports continues to shift, the Mountain West continues to change. This year, the conference is without BYU and Utah for the first time in its history. Aside from the fact that the state of Utah was sort of the center of the conference for many years, the impact on the basketball side of things cannot be overstated. In the 12 years that the two schools were a part of the conference, they won five outright regular season titles between them and twice shared the regular season title. TCU will join the two Utah schools as ex-MW members after this year when it joins the Big 12. Temporary Fixes? As old schools depart, new schools come in. 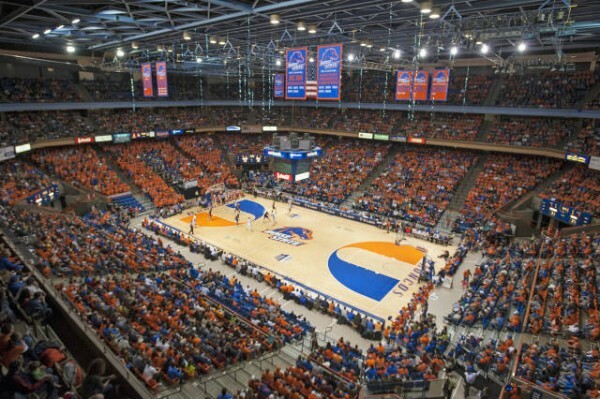 Boise State joins the conference this season, although there are already rumors that its stay may be short-lived, as other conferences including the Big 12 and the Big East, woo the Broncos. Fresno State and Nevada are due to join the conference in 2012-13, but as the ground continues to move under the feet of college athletics, one never knows what changes will come next. Scheduling: With just eight conference teams this year, each team will play just 14 conference games. So while the Pac-12 and Big Ten and other major conferences are kicking off games against their conference rivals on or before New Year’s, MW schools will wait until the middle of January to get into conference play, filling the interim with games against schools like Johnson & Wales, Texas-Pan American, Nebraska-Omaha, Houston Baptist, San Diego Christian and Utah Valley. This is not a good thing for a conference, not a good thing for the fans, and not a good thing for college basketball. Changes On The Sidelines: Aside from having a new team in the conference, we’ve got a couple returning teams with new coaches. The most high profile coaching change comes at UNLV with Lon Kruger gone for Oklahoma, and Dave Rice, the former associate head coach under Dave Rose at BYU, returning to Vegas where he played and served as an assistant under Jerry Tarkanian. The other coaching change is at Wyoming, where Larry Shyatt returns to town after spending the last several years as the associate head coach at Florida. New Favorites. Last year, it was more or less a two-horse race for the conference title between BYU and San Diego State. This year, there is no BYU and SDSU has graduated its four most important players. As a result, it looks to be two new horses who head the pack in search of a conference title with UNLV and New Mexico far and away the favorites. In the MW preseason basketball poll, the Lobos got 22 of the 26 first place votes from the media, with the Rebels snagging the other four. Those two schools also dominated the all-conference team selections, each putting two players on the list.